Phishing is the abuse of your personal information. It is multiple techniques used to get your email password, address, credit card number, social security number, address, bank account access, or they could even try to put a virus on your computer. Whatever it is that a fisher wants, you need to be careful to not give it to them! Most of the time, a phisher can get what they want through a phony email. If an email asks you to click a link that leads to a website that is different than the one listed, the website can probably take over your computer and hack certain accounts. Sometimes phishers make emails using a company logo so that it looks authentic, but the email address actually comes from someplace else. If a suspicious email asks you to "log in at the website below to secure your account," then a phisher could be behind that website getting a hold of whatever information you enter, whether it be passwords or information. Although the above picture may look like an authentic email, it is actually a scam. If it is truly the company that it says it is, then the email will be addressed to you USING YOUR NAME. Your account will have your name, so if you truly are a "valued customer," your name will be used. Any spelling or grammar errors are a sure sign that this is a phishing email. Accounts don't tend to cancel themselves if you aren't always logged on, so if an email threatens that something will happen to your account very soon if you don't enter your information in at this second, that is also most likely a scam. If the link provided is different than the one that is given when you hover over it, DON'T CLICK ON THAT LINK. It will be bringing you to a FAKE website that can possibly take over and steal all of your information from your computer, or get certain information from you because you logged in. Actual companies will have nothing to hide from you if they ask you to go to a website (or suggest that you go to a website). For this reason, real emails will have no reason to change the name of the link because it will be authentic. 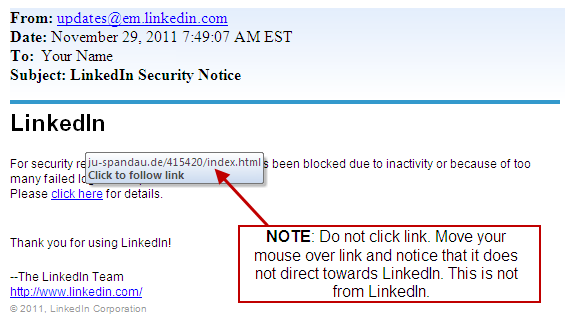 Always hover over the link with your mouse to make sure that both links are the same.